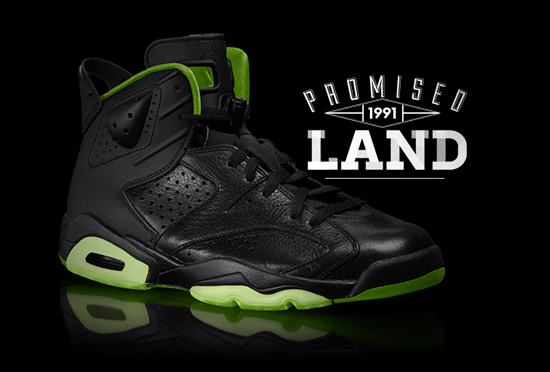 As we continue on with the XX8 Days of Flight today, we take a look back at the Air Jordan VI. "The Air Jordan VI brought in new additions with a rubber tongue and a pronounced pull-tab. Its modified lace lock ensured a consistent fit throughout the game. Break out your ‘sixes’ in Day 6 of XX8 Days Of Flight. www.AJXX8.com"
With 2014 marking the 23rd Anniversary of the Air Jordan VI, I think its safe to say we will see the return of the Air Jordan 6 Retro next year. Following in the foot steps of Air Jordan's III-V, one can hope to see them in OG-style packaging with both original and new colorways releasing. While its only the beginning of 2013 and 2014 seems so far away, lets enjoy this look back at the Air Jordan VI and, look forward to their return next year. For now, enjoy the images below of this sample black and volt green colorway of the Air Jordan VI made exclusively to celebrate the Jordan XX8 Days Of Flight Collection. Be sure to check out my Twitter @ajordanxi and Instagram @ajordanxi as I have submitted pictures of some of my Air Jordan VI collection to share with everyone. You can also see them on the ajordanxi.com official Facebook page here as well.